Researchers investigate how form affects function and aggregation of tau protein in the brain. A unique class of proteins in the human body has the ability to alter their configuration. These so-named intrinsically disordered proteins (IDPs) lack a fixed or ordered three-dimensional structure, which can be influenced by exposure to various chemicals and cellular modifications. A new study by a team from UC Santa Barbara looked at a particular IDP called tau, which plays a critical role in human physiology. Abundant in neurons located in the nervous system, tau stabilizes microtubules, the cytoskeletal elements essential for neuronal functions such as intracellular transport. Lacking a fixed 3-D structure, tau can change shape so that it forms clumps or aggregates, which are associated with Alzheimer’s disease and related dementias. The study is published in the Proceedings of the National Academy of Sciences. The team explain that in the brain, these proteins need to change shape very rapidly to adapt to different conditions adding that it’s important to understand the relationship between protein shape and function and how the medical community can change the shape. So the researchers used these external agents, small molecules called osmolytes, to affect the shape or conformations of these proteins. The researchers not only conducted biological experiments but also ran computer simulations to understand how these small molecules change the shape of tau and, when they do so, how it affects the protein’s ability to aggregate. They found that tau’s structure, whether extended or compact, was associated with how easily it bound to other tau proteins to promote the aggregation process. Continual aggregation of tau can, over time, result in an accumulation of pathological aggregates known as neurofibrillary tangles. These tangles have long been known to be associated with Alzheimer’s disease and related dementias. In computer simulations the team looked at certain chemical interactions called hydrogen bonds. The researchers found that IDPs containing a large number of hydrogen bonds tended to take on smaller, more compact structures, but when they were chemically removed the team could create more extended protein structures. This allowed the group to fine-tune what conformations tau could adopt. In order for aggregates of tau to develop, extended forms of the protein must stick together in a long sheet. The researchers exposed tau fragments to the osmolyte urea, which binds to the extended structures and prevents two of them from coming together. The team were able to show that urea stopped aggregation, but the reason it did so wasn’t clear. However, subsequent computer simulations were able to reveal the interaction of urea with the tau protein, exposing underlying chemical interactions that decreased the likelihood of protein aggregation. The team explain that the chemical structure of urea is quite similar to the backbone of tau. Urea mimics the protein structure and binds to the surface, stopping other pieces of tau from binding to one another because the binding sites are already occupied by urea. The scientists also experimented with another osmolyte, trimethylamine N-oxide (TMAO), which had the exact opposite effect. They found that TMAO-exposed tau formed helical structures, which have been shown in other studies to accelerate aggregation. With TMAO fibrils were observed forming, but with urea they weren’t. Fibrils are the beginning stages of harmful clumps or aggregates of tau. So the predictions from the simulations are actually carrying forward into something pathologically relevant, which is the formation of these big aggregates. Only in recent years has technology advanced to the point where it can shed light on such microcellular functions. One of the many interesting things to come out of the current study, is the idea that various normal and pathological regulatory mechanisms alter the percentage of time proteins are spending in any one of these structures. 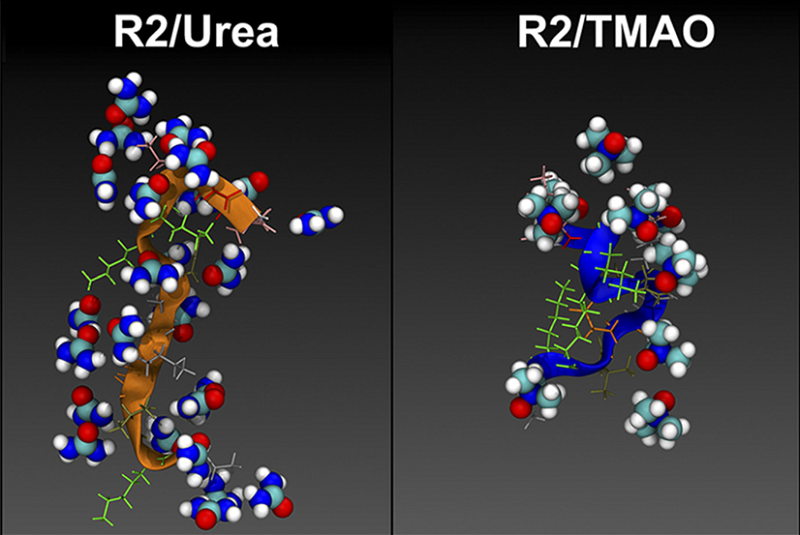 A representative snapshot of the R2/wt tau monomer in the presence of urea (Left) and TMAO (Right). Regulation and aggregation of intrinsically disordered peptides. Shea et al 2015.